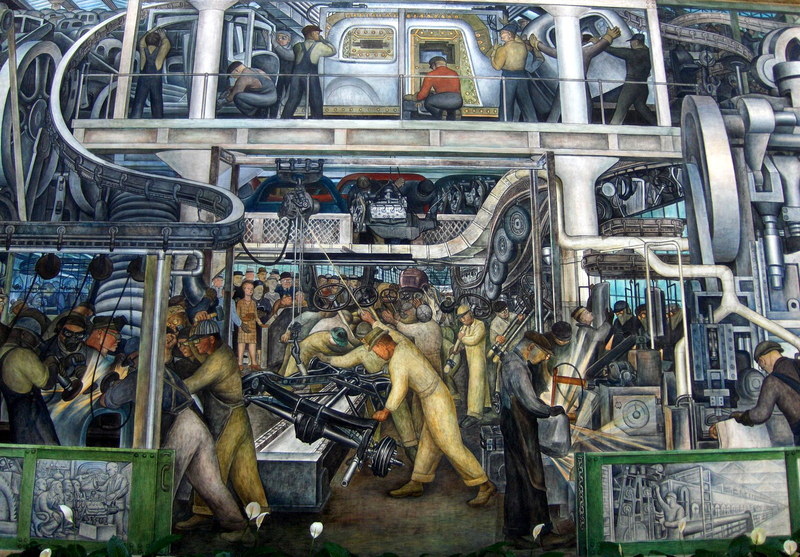 Diego Rivera’s ‘Detroit,’ a detail from one of Rivera’s murals on the car industry. Click on the image for larger view. Yesterday we posted a fact-finding briefing on Rick Perry, the latest and most interesting entrant in the 2012 election. Here’s a similarly link-rich piece on recurring questions of the day: what’s the state of the economy, are Americans really as overtaxed as they think they are, and what has the 2009 economic stimulus accomplished–or not? With the recent Iowa straw poll and President Obama’s bus tour, Americans are hearing a cacophony of arguments about the wobbly economy. The federal stimulus package passed in 2009 was either a deficit-busting failure full of wasteful projects or an unparalleled rescue that would have been more successful if it had only been bigger. Taxes are either stifling or the lowest they’ve ever been. America needs to invest in infrastructure, or “infrastructure” is merely a euphemism for more government spending. So, here’s our guide to the most prevalent economic myths. 1. 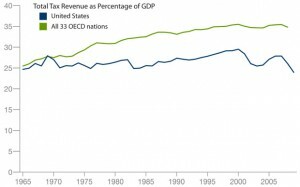 Taxes have been going up and are high compared to levels in other countries. The first part is wrong; the second is also wrong but contains a grain of truth. The percentage of income that Americans spend on taxes is the lowest it’s been since 1958, according an analysis by USA Today. And with the exception of five years after the 1986 Tax Reform Act, the highest marginal income and corporate tax rates are the lowest they’ve been since World War II. Federal taxes as a share of GDP are at their lowest point since 1950, according to the nonpartisan Congressional Budget Office. When all taxes, including state and local, are added up, the proportion of GDP going to taxes has been essentially flat for nearly half a century, according to the Organization for Economic Cooperation and Development. 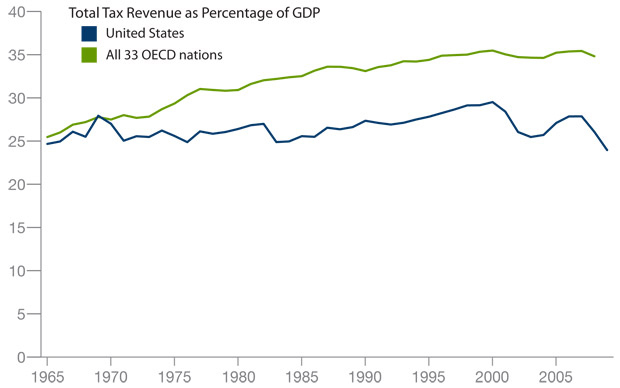 The OECD figures also show that, as a share of GDP, taxes in the United States are lower than in most other developed nations (see the chart to the right). The only income tax hike passed during the Obama administration was part of the health-care reform bill, through which Congress, among other things, raised the Medicare payroll tax for high earners, said Curtis Dubay, a senior tax policy analyst at the Heritage Foundation. The excise tax on cigarettes and other tobacco products was also raised as part of a children’s health insurance bill in February 2009. The problem, he said, is the federal corporate tax rate, which stands at 35 percent. While it’s true the official rate is high, few corporations pay it, said Roberton Williams of the Tax Policy Center. A study he oversaw at the Congressional Budget Office illustrates the point. While the United States has one of the highest tax rates for investments in machinery financed with equity (Figure 2-14), it offers a generous deduction for investments in machinery funded by debt (Figure 2-23). 2. The stimulus failed./The stimulus rescued the economy. Neither. It clearly hasn’t hauled the country back to full employment, but widely-cited economic models show it probably prevented a deeper downturn. Many economists and nonpartisan forecasting firms have credited the American Recovery and Reinvestment Act with increasing employment by at least two million jobs (see Table 8). Although the unemployment rate remains stuck at 9 percent, several economists estimate that unemployment would have been as high as 12 percent and remained high longer without the act. One of the most prominent studies on the stimulus was put out by the economists Alan Blinder and Mark Zandi in July 2010. The pair concluded that while the bank bailout and actions by the Federal Reserve had a greater impact in ending the recession, the stimulus was a critical part of the remedy. “We do not believe it a coincidence that the turnaround from recession to recovery occurred last summer, just as the ARRA was providing its maximum economic benefit,” they wrote. Other analyses have shown less of an impact—that aid for state budgets and education “funded staffing that would have occurred anyway” and that the stimulus saved government jobs while doing little to boost private-sector employment. Critics say it failed because it fell short of what administration officials claimed it would do. They point to a chart, produced shortly before Obama’s inauguration by two of his economic advisers, Christina Romer and Jared Bernstein, which showed that if the stimulus plan were passed, unemployment wouldn’t top 8 percent. But the recession turned out to be much more severe than they and blue-chip economists realized. The goal of the stimulus “was to end the Great Recession and jumpstart our recovery,” said Zandi, who has advised John McCain but has said he’s a registered Democrat. “It did that. It was never intended nor should it be expected to be the source of long-term growth. The plan was always to hand the baton to the private sector. And that was going smoothly until we got creamed” by the European debt crisis and rising gas prices. 3. The stimulus should have been bigger. This is a red herring. Politically, the initial stimulus package almost certainly couldn’t have been bigger because the moderate senators who provided the key votes wouldn’t stomach a package over $800 billion. Indeed, late in the game, Sen. Susan Collins, R-Maine, and others were looking to trim the bill to $650 billion. Regardless of the politics, many economists, including New York Times columnist Paul Krugman, insist the stimulus was too weak to deal with the crisis. Other economists, including John F. Cogan and John B. Taylor at Stanford University and the Hoover Institution, argue that the amount of stimulus spending wouldn’t have mattered because it mainly reduced borrowing by state and local governments rather than increasing spending. So, they contend, the predicted benefits were washed out. In any case, the total stimulus is bigger than you might have thought. Since the Recovery Act, Congress has approved hundreds of billions of dollars in additional stimulus measures, including the renewal of unemployment benefits, this year’s payroll tax cut and the extensions of the education jobs fund and the homebuyer tax credit. The total is now well over a trillion dollars. 4. The stimulus was all projects. Nope. The Recovery Act as passed was estimated to cost about $787 billion. More than a third of that was tax cuts, and another third was entitlements, such as unemployment benefits and Medicaid assistance. Of the $275 billion in spending by federal agencies, less than $200 billion was dedicated to projects. The projected cost of the Recovery Act is now $830 billion, largely because of the qualification of more people qualifying for entitlements and the popularity of some tax credits. 5. The stimulus will have no lasting legacy. False. It’s been said that while the New Deal left behind a landscape of bridges and dams, the stimulus did little more than fill potholes and create a lot of temporary jobs. In truth, the Recovery Act provided critical funding for a number of projects that people will be able to point to generations from now. *House Republicans have argued that an internal White House memo indicates that subsidies for the wind farm might be overly generous. Are the jobs only temporary? A lot of stimulus money allowed schools to retain permanent employees, and some short-term workers landed full-time jobs. As for construction work, it’s by nature a compilation of temporary jobs. When business is strong, workers move from one project to the next earning steady paychecks. During cold spells and downturns, work dries up and the firms lay off their crews for months at a time. 6. The stimulus has been full of/free of fraud, waste and abuse. After Hurricane Katrina and the Iraq reconstruction, many analysts predicted that the federal stimulus program would be rife with fraud, waste and abuse. At least so far, it hasn’t been. Earl Devaney, the inspector general put in charge of stimulus oversight, testified at a congressional hearing in June that “there have been only 144 convictions involving a little over $1.9 million.” That’s less than 0.01 percent of the total program. Still, criminal fraud cases take a long time to develop. Since Devaney spoke, 41 new convictions have been added to the books, and more could come. The Recovery Accountability and Transparency Board has received more than 7,000 complaints leading to 1,500 open investigations. 7. Infrastructure is the answer for unemployment. The construction industry was one of the hardest-hit sectors in the recession, with 27 percent unemployment at its worst. (It’s now 14 percent.) But building homes requires skills different from building infrastructure, said Ken Simonson, economist for the construction trade group Associated General Contractors of America. And unemployment is running high in heavy and civil engineering construction, which has lost 160,000 jobs since July 2007, nearly twice as many as the stimulus transportation projects created. Those workers are likely to land infrastructure jobs ahead of the 400,000 homebuilders who lost their jobs over the same period. For all sectors of the economy, a grim problem is the long-term unemployed—those out of work six months or longer—who now make up 44 percent of the total jobless pool. The Federal Reserve reported in July that workers unemployed a month or less had a three in 10 chance of finding a job while the odds for the long-term jobless were one in 10. Michael Grabell is working on a book Money Well Spent? : What Really Happened to the Trillion-Dollar Stimulus Plan, due out in January from PublicAffairs.